The Rakhine, formerly known as the Arakanese, migrated from the southwestern state of Rakhine in Myanmar. The Rakhine in North America tend to mix with other people groups from Myanmar, especially those who are conversant in the commonly spoken trade language, Burmese, in Myanmar. In 2012, violence between the Rohingya, who also reside in the Rakhine state, and the Buddhist community killed hundreds and forced thousands of Rohingya and Rakhine people to flee their homes. Since then, Rakhine began arriving as refugees in North America. Their language closely related to and generally mutually intelligible with the Burmese language in Myanmar. 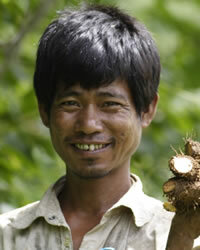 Moreover, their culture is similar to the dominant Burmese culture but with more Indian influence. They are known for "Kyin", traditional wrestling matches. Moreover, they value various traditional dances and music. For instance, the "Ngasin nite" is a solo performance where an individual recites a story and acts out the various roles at the same time. They are predominantly Theravada Buddhists and one of the four main Buddhist people groups of Myanmar (the others being the Bhama, Shan and Mon people). They claim to be one of the first groups to become followers of Gautama Buddha in Southeast Asia. Pray evangelical Burmese people will intentionally become friends with Rakhine people and show the love of Christ via words and deeds. Pray Christians will intentionally engage Burmese people seeking to discover the Rakhine people. Pray Christians will come alongside Rakhine as they adjust to North America becoming their friend and meeting their spiritual and physical needs.